News in Youth Services: What's in your pocket? Hopefully a library card! What's in your pocket? Hopefully a library card! Hello again my friends. You know I truly love my job at the Roselle Public Library. It is so awesome to be able to check out materials whenever I want to, especially the new titles we get in all the time. I always have my library card in my pocket ready for action. I never know what I will be in the mood for when I enter the library; do I feel like music? a movie? an audio book? a Museum Pass? or the classic hardcover book? What's that you say? You don't have a library card? 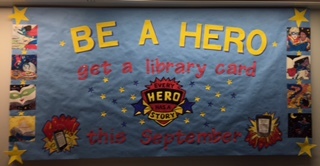 Well fear not because September is National Library Card Sign-Up Month. All you have to do is bring a parent with you and visit the circulation department. Your parent should bring an ID that shows your family resides within the boundaries for the Roselle Public Library District and bingo!...you are the proud owner of a Roselle Public Library card!!! AND you also get a FREE book just for signing up along with the possibility of receiving additional giveaways. This sounds like such a fantastic deal!!! That library card gives you the power to be able to check out materials from the library and to attend the great programs we have to offer like Kreative Kids, Mad Science, STEAM Sunday and Books and Popcorn. So don't dilly-dally, get the the library lickety-split and sign up for that library card. Tell them Mrs. Seuss sent you!